Who said chili needs beef? 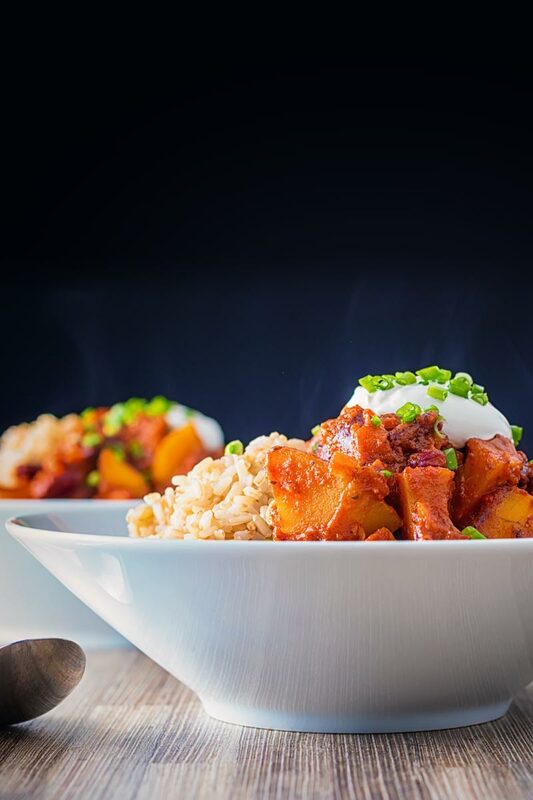 This spicy pumpkin chili will surprise and delight even the most committed of carnivores and may even turn a pumpkin skeptic! Quick & Easy Pumpkin Chili. It does feel great to be posting recipes from our garden again. This pumpkin chili recipe is definitely a winter warming favourite in our household. A really quick and simple meal that can be on your table in 40 minutes and 10 minutes of that is preparation time. Another 20 minutes is allowing it to bubble and simmer away. It is full of all the flavours you associate with a good ol’ tex mex chili. Flavours like cumin, tomato, beans and of course chili but the sweet earthiness of the pumpkin still stands up and remains the star of the show. Of course, this is no better, or indeed worse than a beef or pork chili. 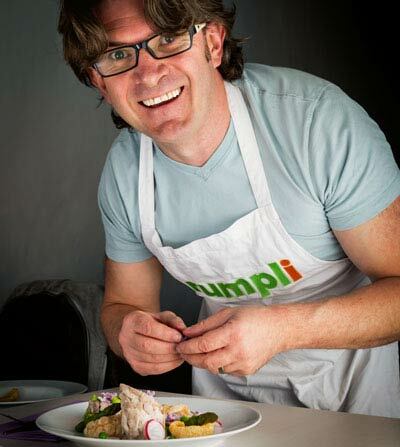 It is different and when I am cooking food sans meat I like to celebrate the difference rather than turn the key ingredients into meat substitutes. I make pumpkin chili recipe because I want pumpkin chili. Not because I want something to replace beef! I think that mindset very much defines my approach to the vegetarian cooking that I do. As a meat eater and my self-confessed ambivalence towards diet-based eating my vegetarian meals are born of the love of the ingredients. Not the avoidance of ingredients. So this easy pumpkin chili, like my pumpkin curry or pumpkin lasagne are all about the joy of pumpkin. Likewise, my bubble and squeak and grilled cabbage hearts are a celebration of cabbage. It is odd cooking for my little corner of the internet at this time of year. All summer I have been playing around on and off with darker photographs to break up the brightness. Now I find myself almost exclusively taking photographs against a darker background. Of course, this is due to the fact that it is now dark when I cook and take my pictures. We live right on the Eastern edge of the of the Central European Time Zone. So as I write this in the middle of November the sunsets at around 4:40, however by the time we get to midwinter that will be closer to 3:45! I see lots of chatter on the interweb from folk that get terribly sad because the nights draw in. I personally love it, there is something very satisfying about ‘closing up shop’ at 4pm. Then making a cuppa from the kettle that permanently sits on top of our wood burning stove (unless that spot is taken by mulled wine). Before heading into the kitchen to make something warming like pumpkin chili. I like to serve this with brown rice for the nuttiness and a dollop of sour cream and some fresh chives. Yum! I love how thick this recipe is and you can pair it with brown rice. Well done! YUM! Pumpkin is such a nice addition to this recipe. It snowed here again today so a bowl of chili sounds delightful! 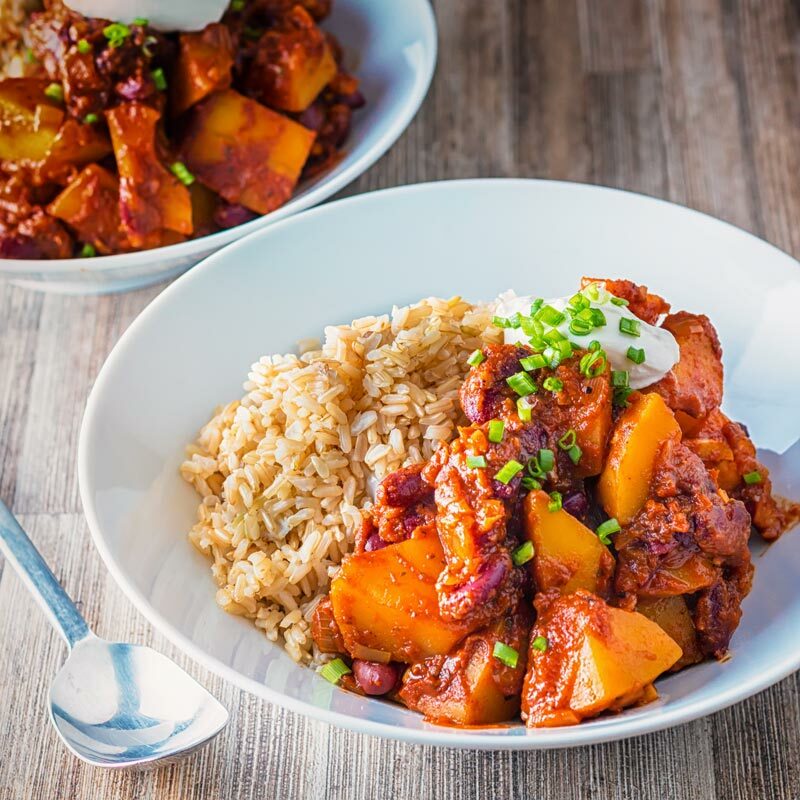 Thank you for sharing this recipe, we are always looking vegetarian recipe for Fridays and this Pumpkin Chili is perfect. Never would have come up with something like this myself. And of course, it looks fabulous. Thank you, a favourite of ours! I have GOT to try this – love the idea of using seasonal ingredients. I am NOT a big pumpkin fan, but I could get behind this one, Brian! Looks lovely. I was never on the Pumpkin bandwagon until last year and now I can’t get enough! Thank you, it is really tasty. Wow! And I thought our days were short! 3:45… yuck! Anyways, this chili looks diving. I’m sure the pumpkin adds an awesome flavor and texture! Thank you, I quite like the early nights… We fire up the log burner curl up on the sofa with a glass of something nice and relax, it does get a bit taxing by the end of winter though. I adore chili…any kind of chili! And this pumpkin chili looks completely amazing – can’t wait to give this a try … especially with it being pumpkin season here! 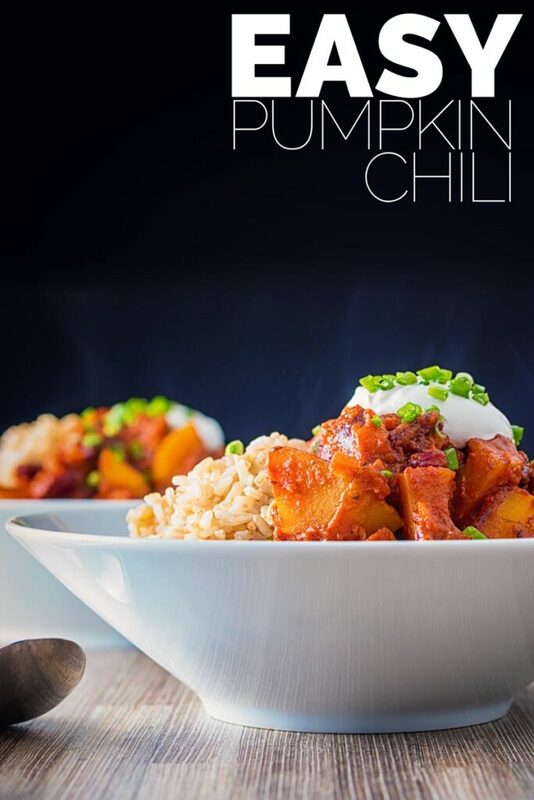 I haven’t tried pumpkin chili yet, but I definitely want to try it after seeing your recipe. This looks so delicious and the photos are beautiful!! Thank you Sherri, I love pumpkin chili a wonderful quick solution to needing a bit of spice. 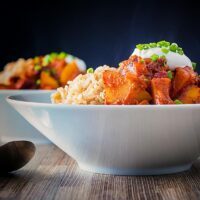 Your post and photos convince me to try vegetarian dishes, and to be more adventurous with pumpkin, which is my childhood nemesis….chili is definitely the way to go! Pumpkin anything is delicious! I pinned this one… Thanks Brian! Cheers Paul… It certainly works for us, glad we have loads of Pumpkin this year, we are gonna be making this a lot! This looks heavenly! What a perfect comforting dinner! Pumpkin is awesome…it can be used in both savoury and sweet. Works well in this dish….lots of flavour and good for you too!! It certainly is Gloria, however I have never eaten pumpkin in anything sweet… It seems to be very common on the other side of the pond but not something I have experienced here in Europe. 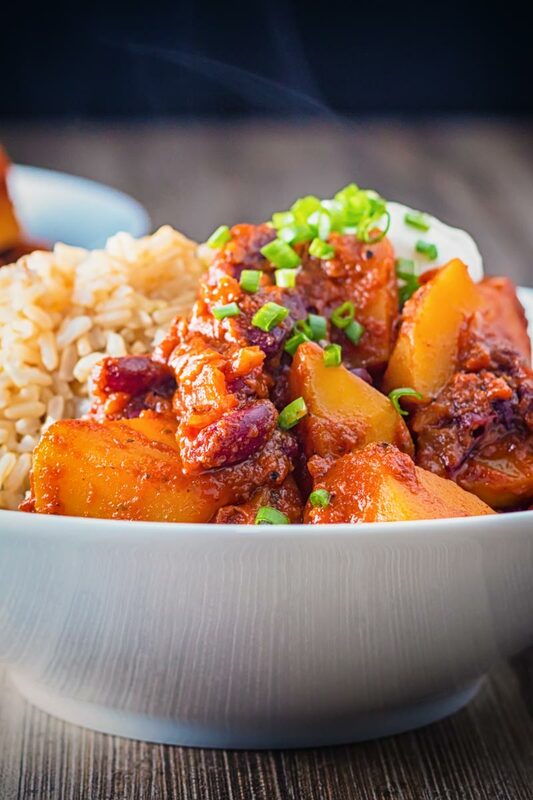 We eat chili over rice, as well! The flavours in this dish are on point. Perfect for the cold front we are currently facing. Thank you Jacqueline, rice with chili was just the way it was served when I was growing up and it is such a favourite I rarel waiver, buzt I do like whole grain rice over white due to the nutty flavour it has. I love this idea! I can’t wait to give this a shot sometime. Great photos, as well! I love the color pop and the styling. Yum, I’m loving this recipe. I’m always after vegetarian meal ideas and this is a good one. I have Hawaiian friends who eat rice with EVERYthing and they totally turned me on to serving chili over rice. Love it!